Our room at school is really "beginning to look a lot like Christmas." It is so beautiful. I love when all the decorations start going up. The room just comes alive. I thought I would share with you some of the items we put up. One or our Pre-K classes have decided to add a splash to our Precious Moments manger scene. First the class made some stars. The teacher had pre-cut star shapes for the children and squares of blue and yellow tissue paper. The children painted the stars with glue then added the tissue paper. She also gave them angels to color. After the angels were colored, they were cut out. 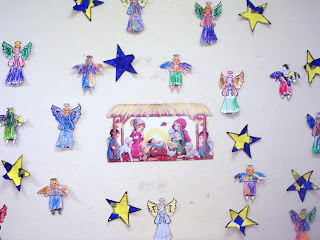 Finally everything, stars and angels were hung on the wall around the manger scene--Beautiful. Our other Pre-K teacher decided to hang some "Christmas lights." It was funny because the children told her "these aren't Christmas lights." Well, I guess you have to be over 30 to remember these kinds of lights(how do you like that age I picked:). They look great though. Each child got a pre-cut bulb--she used red and green. The children then drew on the bulb with glue, then added glitter to make them sparkle. The teacher strung some yarn and attached the lights. I think they are adorable. 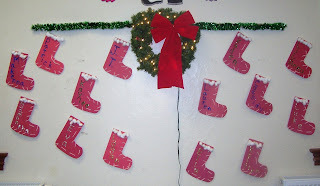 Finally, as you saw on my stockings post, my wall has the marvelous stockings the children sewed together. Coming to our room really puts one in the Christmas spirit.